Switzerland is known for many historical items that are considered to be the world’s finest. Among those items are watches by Girard Perregaux. Girard-Perregaux is one of the few authentic Swiss watch Manufactures. It designs, creates, develops and produces both the external components of a watch and its “heart”, the movement. Watches created by Girard Perregauxare intricate time pieces that tell more than time, they give the owner a prestigious work of art that is the exquisite centerpiece to their wardrobe. Haunting beauty has kept Girard Perregaux ranked top among the elite Swiss. In 1791 a young Jean-Francois Bautte began learning the watchmaking trade and established Girard Perregaux in Geneva. He was renowned for making ultra-thin watches that caught the attention of the future Queen Victoria. 1791 Bautte opened the very first manufacturing company that housed all of the watchmaking trades under a single roof. 1837 Jean-Samuel Rossel and Jacques Bautte begin their reign over the high quality company that was remarkably successful in the watchmaking industry giving Switzerland a brilliant artistic legacy. 1856 Constant Girard wedded Marie Perregaux in 1854 and two years later Girard-Perregaux Manufacture in La Chaux-de-Fonds was established. 1867 Constant Girard-Perregaux created a Tourbillon which became a prizewinner in Paris at the Paris Universal Exhibition. The Tourbillon acquired a medal, gold, and by the 1900’s it was declared out of competition as singular winner. 1880 A wristwatch was developed with German naval officers in mind. The German Kaiser Wilhelm I ordered two thousand watches to be made. This was the first major sale of wristwatches on the market. However the wristwatch would not become popular and widely used until the following century. 1903 Constant Girard-Galletacquired control of the business from his predecessor. 1928 A German watchmaker, Otto Graef, and the proprietor of MIMO Brand of watches, increased the capital stock for Girard-Perregaux. Wristwatch sales finally exceed the sale of pocket watches, practically fifty years after Constant Girard predicted. 1940 The Girard-PerregauxBrand branches out to the Americas and Europe. 1966 With an in-house R&D team, Girard-Perregaux established the primary high frequency movement. This would enable watches to keep excellent time. 1970 The first quartz wristwatch was produced by Girard-Perregaux and set a universal standard. 1981 Quartz watches become more popular forcing Girard-Perregaux to remake twenty of their famous Tourbillon pocketwatches. 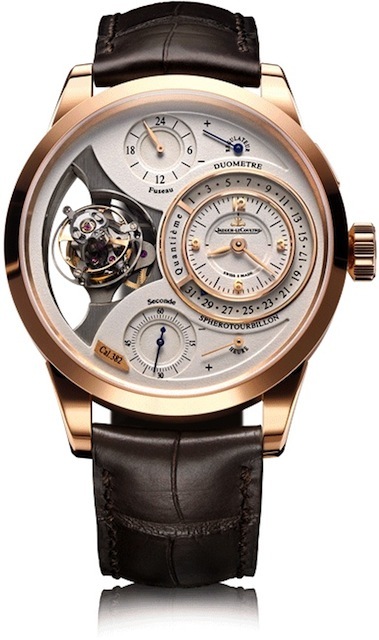 1991 The Tourbillon has been presented as a miniaturized wristwatch in celebration of their bicentenary. 1992 Former racer, architect and Italian entrepreneur Luigi Macaluso, takes over Girard-Perregaux. 1993 Girard-Perregaux signs with Ferrari and creates a limited edition split-second chronograph with the famous prancing horses stamped on the back. 1999 An automatic winding version of the famous Tourbillon is created as an entry to Salon International de la Haute Horlogerie. 2004 Girard-Perregaux introduces a new line of watches for ladies that come complete with petite complication mechanical actions. 2007 The world famous watchmaking manufacturer opens boutiques in Shanghai, China and Bejing. Throughout time, Girard-Perregaux has built a very strong reputation built on quality craftsmanship by only the best watchmakers. From the very beginning they have based all of their work on innovative ideas that have flourished through the past two centuries. When time demanded an exclusive timepiece, Girard-Perregaux delivered. Today Girard-Perregaux has become world renowned and continues to produce timepieces that are considered top in their line and exclusively prestigious. In keeping with their high standards, they continue to offer watches that captivate not only time, but the individual who has made an investment in their personal time piece. The Ladies Cat’s Eye High Jewelry is a version of the Tourbillon with the gold bridge, made completely of white gold and thirty one jewels. The dimensions are 32.90 x 38.40 millimeters in diameter and 12.57 millimeters in height. This luxurious watch has a case set of one hundred and fifty five diamond baguettes and the dial has one hundred and six different diamond baguettes. The crown set consists of twelve diamond baguettes with one rose cut diamond. The pin buckle has thirteen diamond baguettes. This exquisite watch comes exclusive with its own tiny slot machine and chime mechanism. Thirty eight jewels are set in pink gold with the dimensions of 43.00 x 43.95 millimeters with 17.30 millimeters in height. The sapphire crystal case is secured by a total of four screws. The Jackpot Tourbillon is water resistant up to one hundred feet. Girard-Perregaux is an authentic Swiss watch creator with a design and development that are truly one of a kind. The heart of their timepieces is created in the same place that their external components are designed. This gives them an exclusive ability to make the mechanisms of their watches an integral part of the design. Girard-Perregaux is in an exclusive class of their own. Tremendous thought and time have been interwoven through two centuries of award winning watches, starting with pocket watches and graduating to wrist watches. From the exquisite design to the distinguished craftsmanship of the time piece, these Swiss watches are one of a kind and will go down in history while continuing to produce quality watches for centuries to come.